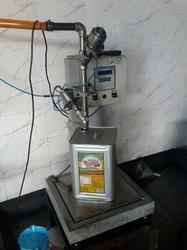 Liquid filling machine use for : hair oil, shampoo, groundnut oil, lubricants oil, cold drinks, milk and similar products. Electric Motor: 1 HP. 960m RPM or 1440 RPM approx. We are successfully meeting the varied requirements of our clients by providing the best quality range of Automatic Four Head Liquid Filling Machine. Oil gears machine 9 fut Centars 12" Bor 80mm Bed 15"
Paste Filling Machine which is highly effective and efficient. Our paste filling machine is made up of best quality equipments and parts so that there is no compromise in the quality. We supply an exclusive range of paste filling machines such as Semi Automatic Paste Filling Machine, Liquid & Cream Filling Machine etc. We offer a wide range of Fully automatic Liquid Filling Machine, which is used to fill pharmaceutical liquids in bottles. Highly Suitable for industries like food and beverages, chemicals, pharmaceutical, cosmetic etc.